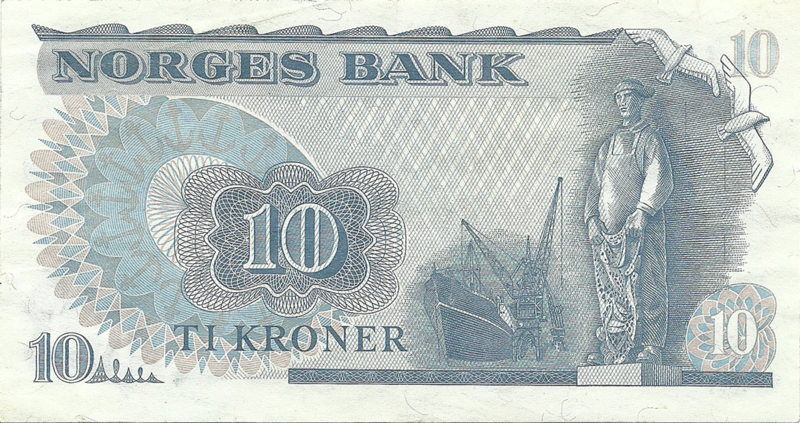 The engraving on banknote made, approximately, from this photo of Fridtjof Wedel-Jarlsberg Nansen. Fridtjof Nansen (10 October 1861 – 13 May 1930) was a Norwegian explorer, scientist, diplomat, humanitarian and Nobel Peace Prize laureate. In his youth a champion skier and ice skater, he led the team that made the first crossing of the Greenland interior in 1888, cross-country skiing on the island, and won international fame after reaching a record northern latitude of 86°14′ during his North Pole expedition of 1893-1896. Although he retired from exploration after his return to Norway, his techniques of polar travel and his innovations in equipment and clothing influenced a generation of subsequent Arctic and Antarctic expeditions. 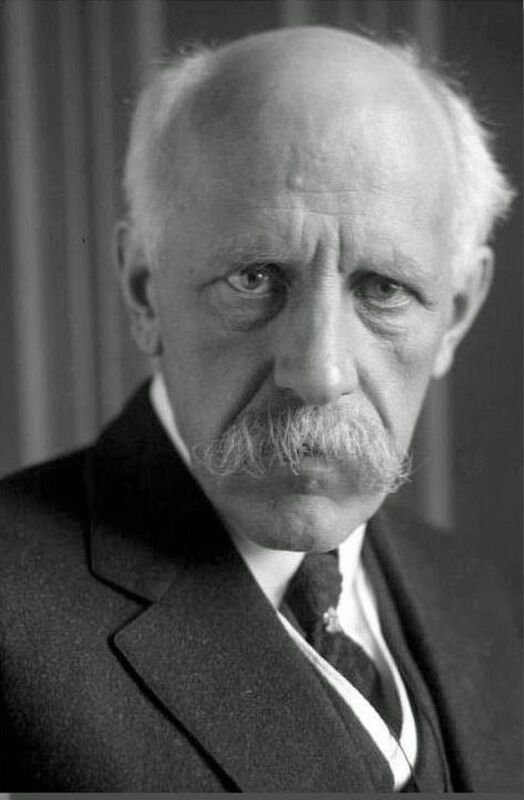 Nansen studied zoology at the Royal Frederick University in Christiania (renamed Oslo in 1925), and later worked as a curator at the Bergen Museum where his research on the central nervous system of lower marine creatures earned him a doctorate and helped establish modern theories of neurology. After 1896 his main scientific interest switched to oceanography; in the course of his research he made many scientific cruises, mainly in the North Atlantic, and contributed to the development of modern oceanographic equipment. 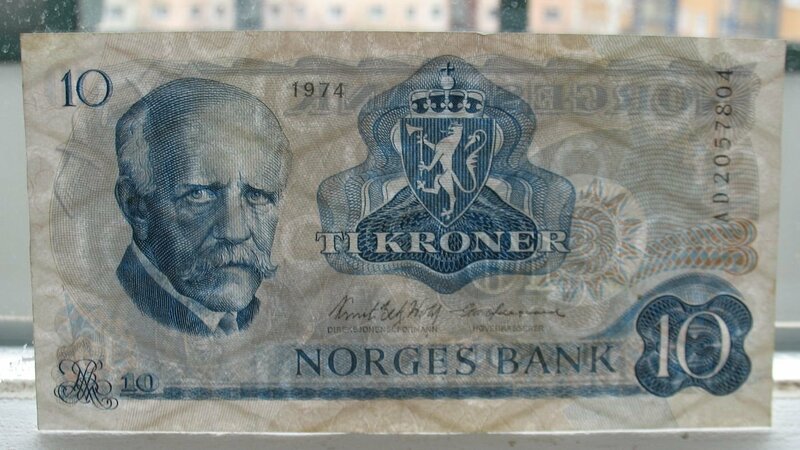 As one of his country's leading citizens, in 1905 Nansen spoke out for the ending of Norway's union with Sweden, and was instrumental in persuading Prince Carl of Denmark to accept the throne of the newly independent Norway. 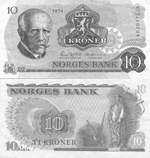 Between 1906 and 1908 he served as the Norwegian representative in London, where he helped negotiate the Integrity Treaty that guaranteed Norway's independent status. In the final decade of his life, Nansen devoted himself primarily to the League of Nations, following his appointment in 1921 as the League's High Commissioner for Refugees. In 1922 he was awarded the Nobel Peace Prize for his work on behalf of the displaced victims of the First World War and related conflicts. Among the initiatives he introduced was the "Nansen passport" for stateless persons, a certificate recognised by more than 50 countries. He worked on behalf of refugees until his sudden death in 1930, after which the League established the Nansen International Office for Refugees to ensure that his work continued. This office received the Nobel Peace Prize for 1938. Nansen was honoured by many nations, and his name is commemorated in numerous geographical features, particularly in the polar regions. Centered is the coat of arms of Norway. The coat of arms of Norway. A golden lion on a red shield was adopted in or before the early part of the XIII century. In the late part of the same century, a silver axe was added. In continuous use since then, the coat of arms is one of the oldest state coats of arms in the world. The official blazon is: Gules, a lion rampant or, crowned or and bearing an axe with blade argent. Among the state coats of arms that are still in use today, the Coat of Arms of Norway is among the oldest in Europe and even world-wide. It is known since the early XIII century, when it served as the coat of arms of the kings of the Sverre dynasty. 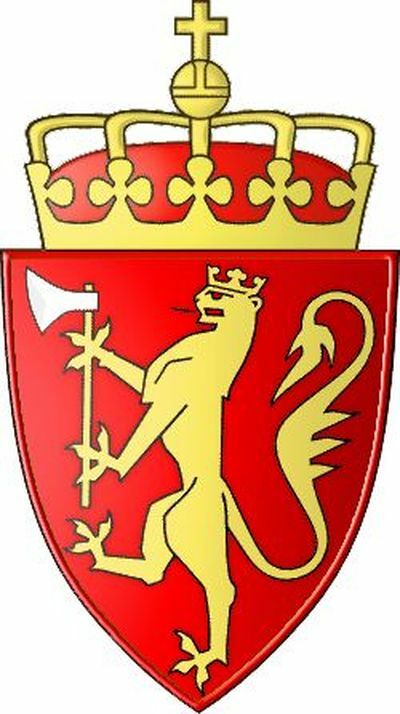 It is told that Sverre, who was King between 1184 and 1202, had a lion in his coat of arms. This coat of arms appears in 1225, when it was used by Earl Skule Bårdsson, who had relations to the royal family. A coat of arms with a lion was also used by Haakon the Young Haakonson, who was King between 1240 and 1257. This was in 1250. Haakon the Young's father, King Haakon the Old Haakonson, had a lion in his seal. This lion, however, does not appear in a coat of arms, but in the shape of a small lion which lies between the King's feet. This might be the same lion that Earl Skule and Haakon the Young used in their seals. On the other hand, lions were a frequently used symbol of kings and royal power. Snorre Sturlason claims that a golden lion on a red background was used already in 1103 by King Magnus III, the son of King Olav III. In 1894, historian Gustav Storm concluded that this is ahistorical. Storm explained that the claimed lion in King Magnus's coat of arms is unknown both in the older Saga literature and in other contemporary sources. It is possible that Snorre, who wrote under the instruction of the King, attributed King Sverre's coat of arms to earlier Kings of Norway. Approximately in 1280, either King Magnus VI (dead in 1280) or the guardianship of his son Eric Magnuson let the lion be equipped with a crown of gold and in the foremost paws an axe of silver. The axe was a symbol of Saint Olaf, i.e. King Olaf II, and by inserting it into the coat of arms it was symbolized that the King was the rightful heir and descendant of the "Eternal King of Norway" (Latin: Rex Perpetuus Norvegiae). 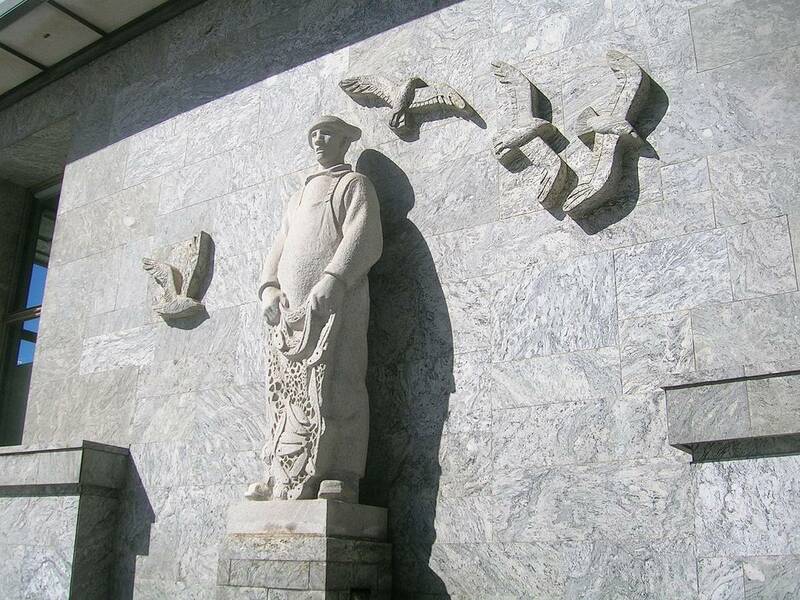 Nils Flakstad's granite sculpture "Fiskeren" ("The Fisherman", 1941) at Oslo City Hall's west wall. Also depicted a fishing trawler in port, near the cranes. Nils Erik Flakstad (born 9 August 1907 in Hamar, died on 31 July 1979 in Oslo) was a Norwegian sculptor, son of businessperson and politician Nils Erik Flakstad. He studied at the Norwegian National Academy of Craft and Art Industry from 1928 to 1930, and at the Norwegian National Academy of Fine Arts from 1930 to 1932. He was a teacher at the Norwegian National Academy of Craft and Art Industry 1955–1975. He started as a painter and first began in the late 1930s with sculpture. Among his works include contributions at Oslo City Hall, in front of Haugesund City Hall, a relief of the Parliamentary stair hall at Stortinget, and monuments to fallen Norwegian patriots during World War II in Hamar, Haugesund and Akershus Fortress. Denominations in numerals are in three corners, in words and in numeral centered. 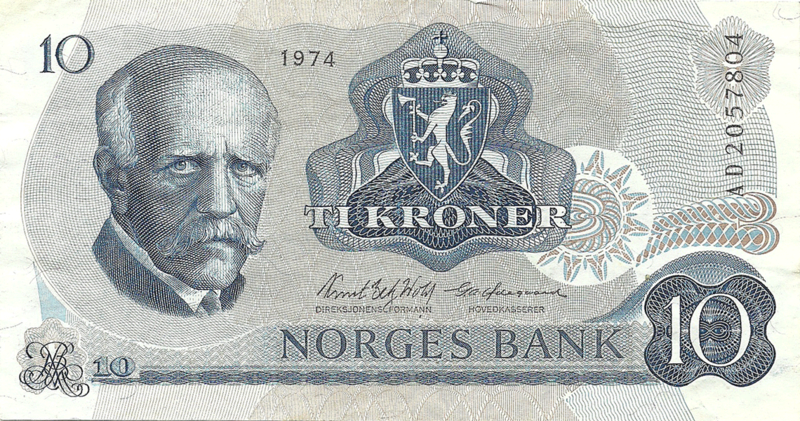 Designers: Knut Løkke-Sørensen (obverse side) and Henry Welde (reverse side).